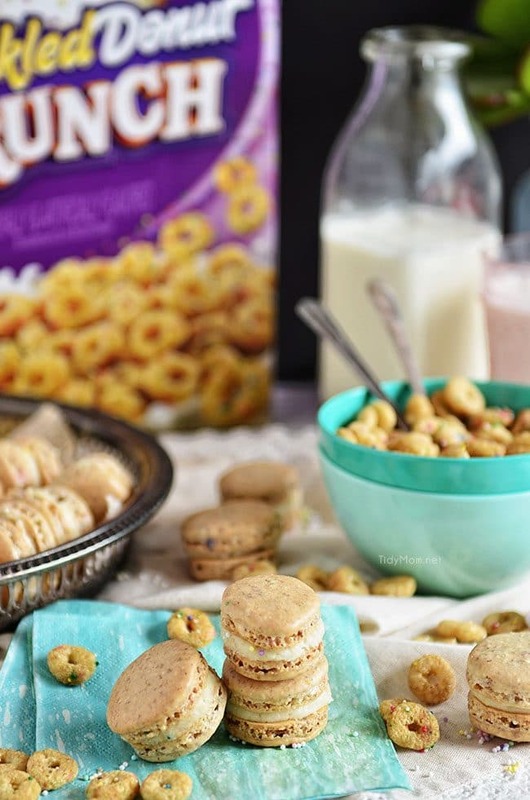 Cap’n Crunch Sprinkled Donuts cereal isn’t just for breakfast! Is it a breakfast cereal? a sprinkled donut? a cookie? 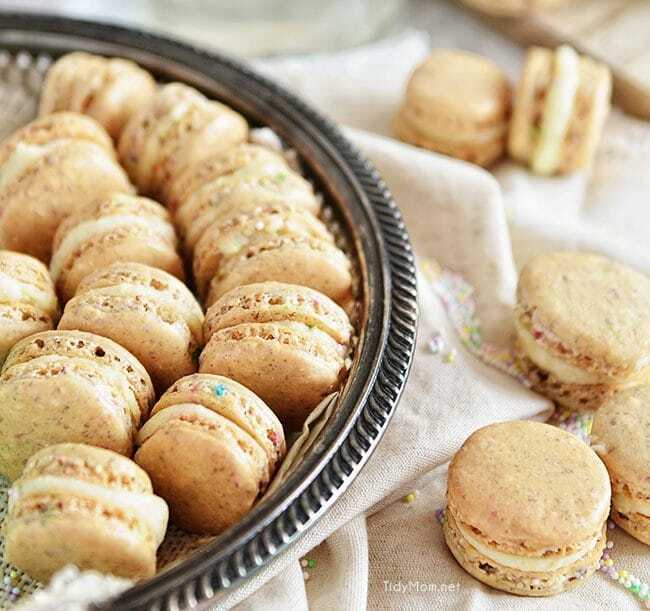 Sprinkle Donut Macarons combine the flavors of the childhood cereal Cap’n Crunch with a fun sprinkled donuts for a delicate and delightful macaron cookie. 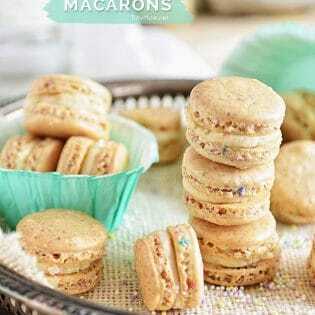 Macarons have been on my baking bucket list for quite some time. I love love love eating them, but I know macarons can be a little tricky to make. They have a reputation for being “difficult” and high maintenance. You have to sift, and age, weigh not measure, don’t over mix or under mix, don’t bake on a humid day…..yadda yadda yadda. Quite intimidating for such a delicious little treat!! If you’ve never had a macaron, they are delicate, soft and chewy but slightly crispy with a creamy filling. The one thing you will definitely not want to skip out on is having a digital food scale. When making macarons you want to weigh, not measure your ingredients. I got my food scale several years ago and love it! 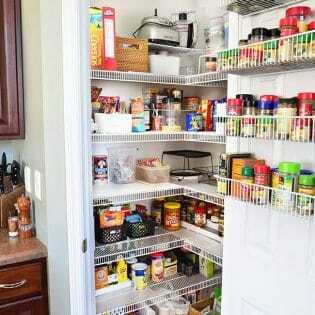 it’s one of those kitchen items that once you have it, you wonder how you ever lived with out it. If you bake a lot, weighing your ingredients is much more accurate. I also use it when I need to divide batter, or when I want to make all of my chocolate chip cookies the same size. I’ll be honest, I had some trouble, and my first batch of macarons didn’t turn out so pretty. The upside is, even if your macarons don’t turn out pretty, they still taste delicious. But while I had everything out, I wanted to try again. So I texted Shaina and Amanda a picture and asked for help!! Apparently I had whipped my egg whites too long, they were too stiff. So I turned to youtube where I found this fabulous video with macaron tips and troubleshooting, The video shows you exactly what every step should look like. Now that I have the basics down, I can’t wait to experiment with more flavors! For this batch I used crushed Cap’n Crunch Sprinkled Donut cereal in the macaron batter and in the filling! There were a HUGE hit!! Next up…..raspberry and chocolate,pistachio, lemon, the list goes on and on. If you’re feeling intimidated by making macarons, please don’t be. I’m kicking myself for not trying them sooner. You just need to take your time and pay attention to details. They’re actually pretty simple, as long as you follow the directions perfectly. If you want to do a little more studying before you jump in, Stella from Brave Tart is a macaron magician. Her posts on macaron making take the scary out of the equation . Preheat oven to 300F degrees, line two baking sheets with parchment paper and weigh out all your ingredients. In a stand mixer with the whisk attachment beat egg whites until foamy, then add granulated sugar and beat on medium-high until stiff peaks form, this should take about 5-8 mins. Set aside. Sift almond flour, powdered sugar and finely ground Cap'n Crunch together into a large mixing bowl (discard larger lumps that wont go thru sifter). Using a rubber spatula, gently fold in the egg whites to the dry ingredients, mixing only until just combined. Be careful not to over-mix or under-mix here. Generally 65-75 turns of your spatula when folding is a good rule. Transfer macaron batter into a large pastry bag with a large round tip attached. Pipe one-inch rounds, about 1/2 inch apart onto a parchment lined baking sheet. Lift the baking sheet up a few inches and give it a hard tap on the counter least 2-3 times to release the air bubbles. This will prevent the tops of your macaroons from cracking. Next, you can either pop them right in the oven for 20-22 minutes. Or, some people say let them sit out for 30-60 mins to allow them time to dry out a bit before hitting the hot oven. When they dry out they can't spread out in the oven, and are forced to rise up. That's what creates the feet! - but other's say this step is not necessary. To prepare buttercream; Whip butter with an electric mixer until pale and fluffy. Slowly add sugar, vanilla and ground Sprinkled Donut Cap'n Crunch and beat on medium high until well combined, scraping down the sides of the bowl as needed. Serve room temperature. Store any remaining macarons in the refrigerator. These are the cutest ever!!! Love!! well thanks Jenny – but your posts really inspired me to finally give them a try!! Wow – you’ve put some of my favorite things all in one macaron. I just love these! These are just too cute!! So creative and pretty! What a cute idea! I have been intimidated to try making them but these look so good I might just go for it. Macarons have been on my bucket list for a long time too. I even bought the little macron baking sheet and still haven’t made them! They scare me but I love them soo much! These look perfect! 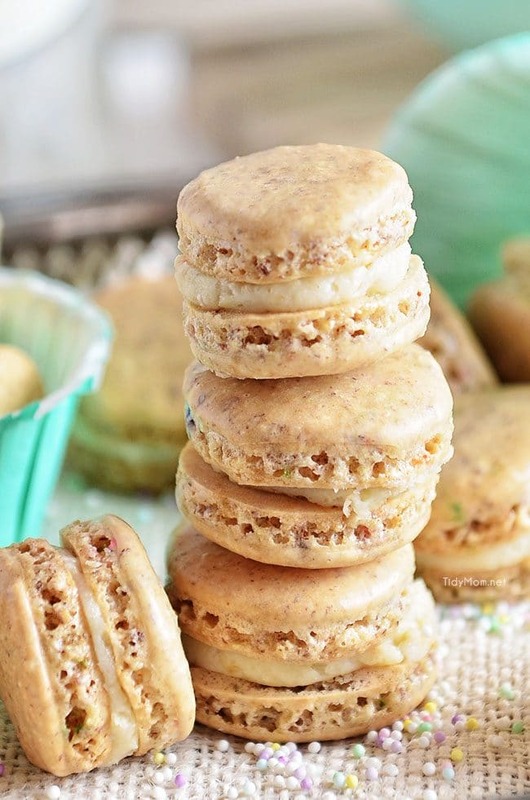 Macarons have been on my baking bucket list forever too! This is inspiring me to get on that — especially with eh fun cereal stirred in! Can you believe I’ve never had a macaron? At least I don’t think I have! I’m craving one now. These turned out so pretty Cheryl! There are 2 things my li’l sweetheart loves: Sprinkles & macarons. I tried making macs once in the past and it was such a disasterous flop, I promised myself I’d never, ever try it again. Of course, we didn’t have our daughter back then. So I’m much more motivated to try to make these now for her. I see you’ve gone metric and love your recipe. How fun are these??!! I have had such mixed results with making macarons, I finally signed up for a local class. Turns out I have so many issues because of the altitude, so I’m excited to try them again with the high altitude changes. 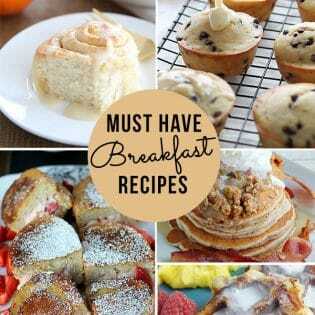 I definitely want to make these because I know my kids would love them! What a fun flavor for macarons! Hi! Stopping by from the Link Party Palooza. These are so cute! If only there was a way to make a donut hole!Thank you for sharing the recipe! 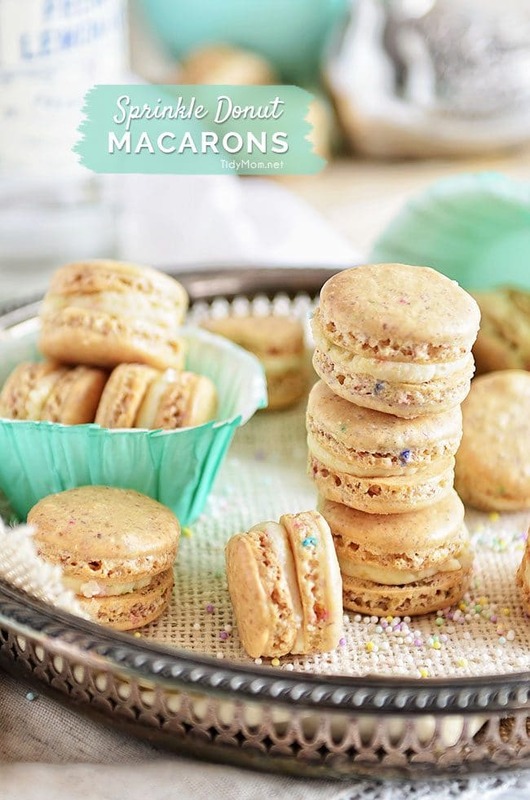 These Sprinkle Donut Macarons look amazing, pinning it! These cookies, their seductive flavor easily be swept into an obsession and your macarons are pure art. These beautiful cookies can freeze merged or unmerged filling and kept in the refrigerator up to a week in a sealed box. Macarons become even better. They are so nice and every effort around them is worth it!